Let’s cut to the chase- you could make anything “buffalo” style, serve it with a great dip and it would taste good. Admit it! I have never seen such a reaction to my vegan food as with this picture. It’s not like my friends are about to become vegan (although a girl can wish) but moreso that they can see the connection between something not healthy to something healthier. I’m all for that! Hence, my mission and name – Reinventing Indulgence. Perhaps others can share my early addiction to buffalo chicken wings. One thing for sure, I had the best comparison there is. The best wings I had ever indulged in were at BJ’s in Fredonia, upstate New York and they were 10 cents; sorry folks but I don’t think it’s there anymore. I have been to Anchor bar in Bufflao where they boast “Home of the Original Buffalo Wing”; they were good but I still thought BJ’s wings were better- crispy not wet. Anyone from Buffalo can tell ya.. they know wings! It’s interesting how we all get so far removed from the animal when discussing eating choices, good times and the memories associated. It’s actually so odd now even saying it.. wings. We eat (ate) the wings off a bird and deep fry them in hot sauce. It’s kinda gross and of course not to mention – cruel. So I’m glad to see the craze returning for something that does not involve an animal part. Although like I said, you can pretty much deep fry anything and throw it in hot sauce. Cauliflower. Here we go – you don’t have to deep fry or even fry it. You can bake these. I have heard a few of my friends making these and have been excited to try it. 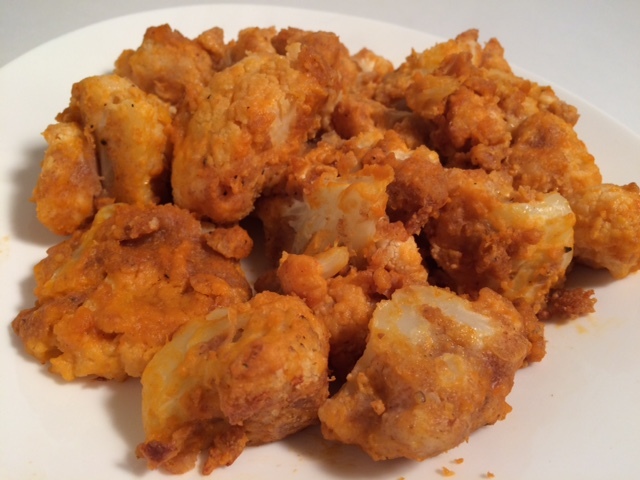 I have had pretty good vegan wings – V Spot in Brooklyn, made from soy and Champs, also in Brooklyn, made from tempeh. Cauliflower works for me so I made a first attempt. I somewhat followed a PETA recipe with my nonchalant ADD type of way. Take (1) – it didn’t taste very well. I used whole wheat flour. I have four flours in my home at the moment – coconut, potato, whole wheat and Teff. The funny part is- I don’t even use them except to experiment. And that’s what this was. I used the whole wheat flour and soy milk. I dipped the cauliflower pieces in and baked it. I had to try it again. Take (2). This time I asked my friend Rachna and she jumped in excitement with her method which was using chick pea flour and club soda. Hmm.. now it’s getting interesting. I bought another head of cauliflower and tried it again. This time though I didn’t have that cool hot sauce. I had mexican hot sauce. I stopped by my favorite place to pay for over market-price fun niche items. I went in for E3 Live- came out spending $166 and didn’t even get the hot sauce because they didnt have Franks, which is my favorite. Funny thing, Whole Foods had a bunch of other sauces but I had to put a few down because of corn syrup (GMO) and egg whites, butter etc. It really shouldn’t be so difficult. It’s just hot sauce. It’s suppose to be vegan. 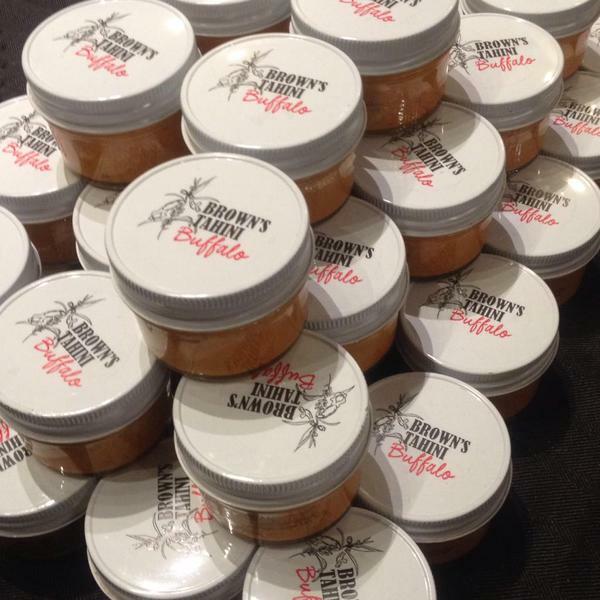 Back to the recipe; The buffalo sauce part called for butter – us vegans.. we got butter! No probs.. lets do this. I start mixing my hot sauce but it was super hot and not that thick so I had to add more butter. I started thinking.. this is not healthy lol But hey.. you think it is right because it’s cauliflower. I didn’t even get to the dip part. Just because it’s vegan- doesn’t mean it’s healthy. So I try to stop adding butter because I dont want a heart attack. I instead switch to tahini. Ok.. I like this. Next time though, when I’m in the mood for this, it’s Frank’s Red Hot or that cool Brown’s Tahini Buffalo sauce. Frank’s Original is definitely vegan. Surprisingly, even though the Frank’s “Wings” sauce says Natural Butter Type Flavor – it too is VEGAN! Major score! Back to the butter ingredient in the recipe for a moment; dairy butter is fattening with a higher percentage of saturated fat than the vegan butter. It also comes from dairy cows fed a diet of GMO feed. Knock yourself out with the argument that you are using grass fed butter. Maybe one in 100k of you are. Do what you want but it’s still abuse at the animal level. As for those who want to indulge in vegan butter, it isn’t the healthiest thing either although you aren’t hurting any animals or supporting the dairy industry. There is plenty of research that saturated fats (especially from animals) and excess omega 6 fats should be minimized and I will definitely add to that and say especially when heated. That being said, remember my Mom’s favorite words.. “everything in moderation”! Food for thought: some doctors even say “no oil” at all – have you ever heard Dr. Caldwell Esselstyn MD. It’s definitely worth checking out. My favorite fats are flax, avocado, raw cacao, nuts, seeds, extra virgin olive oil (not for heat) and extra virgin coconut oil, raw or to heat for sautés. Make a flour batter. I used Bob Mills garbanzo & Fava flour but regular garbanzo bean flour is good. I used between 1/4 to 1/3 of the bag for one head of cauliflower. Mix it with some club soda– not too little, not too much. You don’t want the batter dripping thin but also not too thick and clunky. 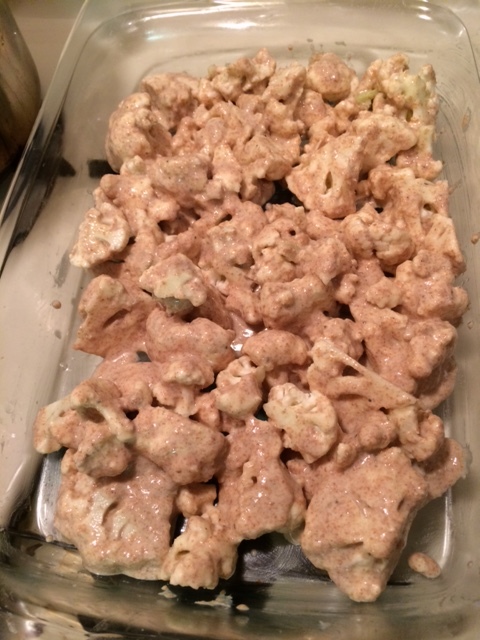 My friend said to use a cookie wire rack for the pieces of cauliflower to drip off after you dip them in the batter. I said, “do I look like a cookie maker to you?” lol. I had no idea what she was talking about! If you have it – use it! You can put tin foil underneath so you don’t make a mess like I did. Actually, it’s called a cooling rack. I learn something new everyday! I’m not sure if they are technically made for inside the oven so please check what it’s made of. Many people do use it for that purpose but you should be careful of non stick surfaces in high oven temperatures. My friend likes it because the cauliflower can cook from underneath while dripping off excess batter. I am researching as I write; the oven friendly version is called a roasting pan if you want to get fancy. Cook for 18 minutes. This is important. It’s best you don’t over cook it or they will be mushy. If you aren’t a professional baker with all sorts of equipment, then they might stick to the pan even, if you did grease it with coconut oil like I did. Prepare the hot sauce mixture: approximately, 1 cup hot sauce and 1 tablespoon of vegan butter (have extra on hand of both if needed). I’d be lying if I didn’t say I used less hot sauce and more vegan butter. I added tahini as well. 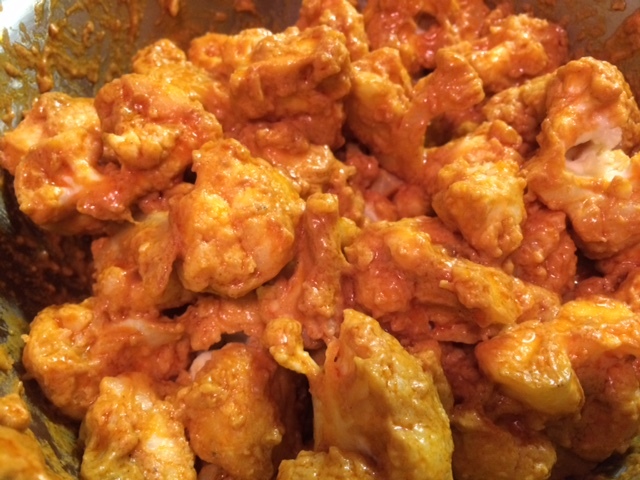 As previously mentioned, next time I will use Frank’s Red Hot and follow the recipe more precisely. I put the baked cauliflower in a stainless steel bowl. I slowly and gently added the hot sauce mixture. You dont want the cauliflower to break apart or get mushy. The recipes generally say to “rebake” for another 8 – 10 minutes. My friend said “don’t rebake.” I agree. I may try it again and do a taste test. Honestly, it was already great! How was i to wait another 10-15 minutes to eat it? The “blue cheese”. Urgh.. you know how I feel about the overrated marketing trap of the dairy industry. Who needs blue cheese? The Buffalo Cauliflower Dip I made was so delicious. I used Hampton Creek’s JUST MAYO. Non vegans are raving about this. Weird but great! I roughly followed this recipe from 86lemons except I used more tahini and forgot about the tofu. Will try that next time. So to sum up the dip part: I used approximately 3/4 cup Just Mayo, 1/4 cup tahini, fresh squeezed lemon, teaspoon apple cider vinegar, almost a tablespoon red wine vinegar and then garlic powder, give or take. I’m sorry, I need a class in recipe writing for sure! 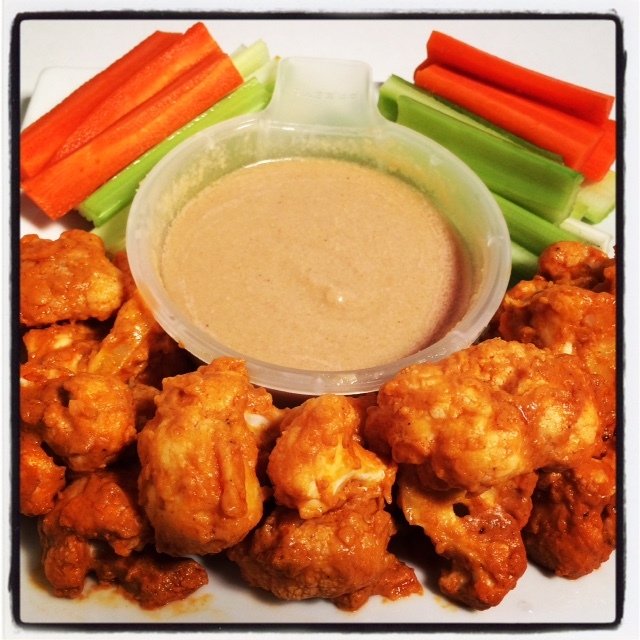 Whatever the wing is.. soy, tempeh, cauliflower or any other vegetable, it’s still going to be all about the hot sauce, the dip and the lovely cut carrots and celery that make you feel like you didn’t just consume 500 calories. But hey.. if that helps you save the wings of one chicken then so be it. Go for it! Visit my Pinterest to see other fun things you can do with cauliflower. Next up for me is cauliflower pizza. Enjoy!